Sybille is a new talent with a fresh style in Native Flute compositions. Though born in Germany - Sybille has always exhibited the best spirit of native music in her performances. 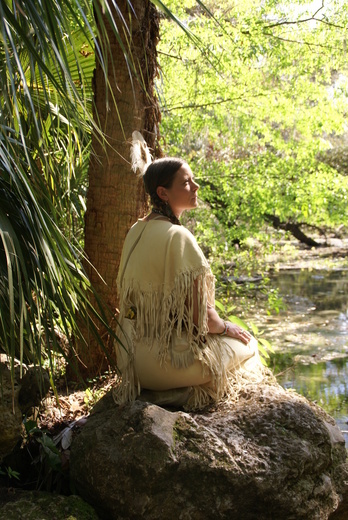 She has appeared as part of the featured entertainment at many powwows in Florida and Georgia. Her debut CD release, "Good Medicine", is filled with the soothing and melodious sounds of her flute songs combined with the wonderfully beautiful sounds of nature. The elements of wind, water, air and fire are combined with the music of mother natures' own singers to provide a relaxing background that blend with Sybilles’ flute melodies and lift the listener into a deep state of relaxation and reflection. Sybille is self–taught; having learned to play the native flute via trial and error as much as from observing other flutists perform. What you hear in her music is not the result of years of formal education. It comes from her heart. She just recently released her new album "Serenity" wich will be followed by another release " Serene ". She also was a registered participant at the Native American Music awarts in the "Native Heart" category of 2011.